This truly is our nemisis. We had another go. This time we had Marv with us as Treehouse was out celebrating his birthday. We got in and Flinkan was ready for war. He was itching to get these down. “Let’s kill these fuckers first try and get onto Nazgrim!” He furiously typed into raid chat. He couldn’t have done a worse thing. “You know now you’ve jinxed us. If we wipe, you’re paying the repair bill…” I said. 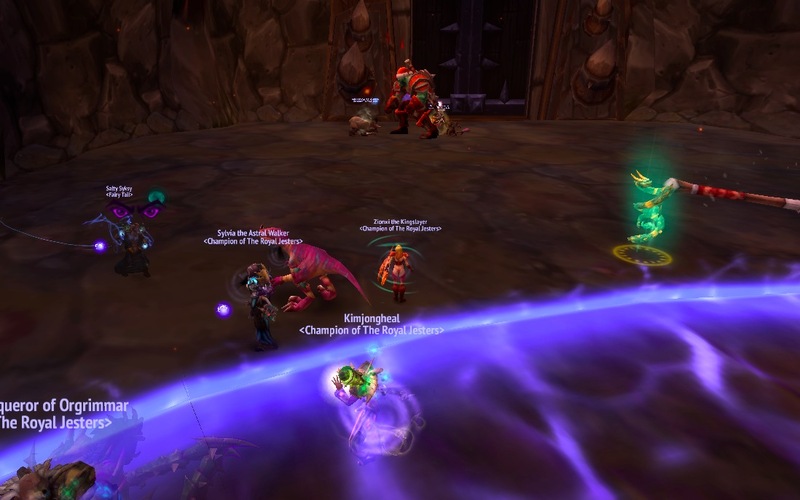 We were getting ready and there was talk about healers not going up and just leaving the tanks to it or having both bosses down and causing chaos. “Are you trying to make it so that Flinkan has to pay the repairs?” I asked. “Yes” was the reply I got. This time I got my act together and went in to reset the bosses after we cleared the trash. I’d stolen Flinkans job. We got to our positions and pulled. It was going well. One dog down and then they pulled one boss up the hill with the other dog following them. “You have a dog!” I squealed over ts. As funny as it would be to wipe and tease Flinkan about paying our bills, doing it this early would not be good. Disaster averted we pressed on. Running to purple near the auction house the worst thing happened. “Omg. WE HAVE AN ADD” I yelled. “What? You’re kidding? !” Tsff blurted. “Nope!” I said as I battled with it. Jolly pulled it off just after it got very angry with me and sacrificed me to Garrosh. Needless to say we didn’t quite clear all the adds. And we may have been somewhat distracted by trying to find more supply crates… But we will gloss over that part! I continued to give directions. It’s amazing how much easier it is to do when you’re dead. We almost contained all of the clouds and swirls to where they should have been but then Jolly snuffed it. “You have a gatecrasher” I called out, forgetting that they weren’t actually up a hill and I didn’t have to yell at them. “Oh what!” Marv started to rally the troops. “Everyone down!” Alas it was too late. Sad times. Flinkan went afk just in time for the repairs. “36 gold” I said on ts. He had heard me and when he got back opened a trade window and put in there 25k gold. There was a moment of hesitation while I hovered my cursor over ‘trade’ when it went green. He cancelled it and skipped away. While we were waiting and before Nanutza switched to her Warlock to give us cookies I noticed that her and Jolly looked quite alike. “You two could be twins” I said. “Hey I quite like that!” Jolly replied. We pressed on to the demolishers. Jumping in them they were being spun around like crazy so they got confused. “I’m spinning around, move out of my way…” Marv started singing. Cue more groaning on ts and the admission that nearly everyone was thinking the same thing. Onto Nazgrim we went. Into the tunnel. Just before we dropped down to bypass the Doomlord Tsff asked if we could kill it. There was no need to but we did anyway. Once they were down Blunnerz spotted some Rogue trainers. I spotted them and walked up. One multi shot later and they were dead. Flinkan who had followed us made a comment in chat. “I killed the poison vendor too” I said on ts. “I’m so glad Aska isn’t here” I laughed. We got to Nazgrim. We killed the adds near the back and were sat down eating when combat started. “Someone pulled?” Tsff asked, suprised. “I’m resetting” Blunnerz replied as all of the Faithful stampeded out of the room after him. I chucked a zeppelin at him. He didn’t notice. “I have my zeppelins ready.” I said, gently encoraging people to start throwing them. Tsff put Blingtron up. Some people didn’t get any to throw. “You can by them” Danue offered. Secretly everyone planned to stock up. Several zeppelins were thrown at Blunnerz as the endless entertainment of him running away from them ensued. He had three hot on his (literal) tail. “If ever there is a boss where you need someone to kite zeppelins them I’m the guy” he said as he was running around. Ant however had other ideas and used his ‘leap of faith’ that he had gained from symbiosis to pull Blunnerz back into them. We stopped messing around long enough to do some boss killing. We had ravagers. Which was fun. The assassin seemed to pick on me and by the last 15% we were being over whelmed by adds. “Can you collect the adds Jelly… oh I mean Jolly!” Tsff asked. Eventually with more coordination and some attempt at making the adds by myself we managed to get him down. “He looked so much better when he had his Santa hat on…” I mused just before he died. “I didn’t even see that” Blunnerz said.